High Voltage Wire :: High Voltage Cables :: Garg Associates Pvt Ltd. The size and weight of electronic and electrical equipment has drastically reduced overs years, requiring smaller and smaller high voltage interconnections in such professional equipment and devices. The reduced life of insulating materials under corona imposes limitations on miniaturisation and choice of materials. Conventional HV cables of large sizes, when bent sharply, are even more prone to corona stress(at bend points) and early failure. GARG'S CR PTFE provides the answer for such applications. We also make regularly shielded high voltage cable for AC application. We make custom multicore high voltage cable and composite cables as well. (e.g. 4 cores of 9 KV DC of 24 AWG and 3 pairs of 26 AWG Type E for signal transmission cabled together). Please contact us for any custom requirements (e.g. 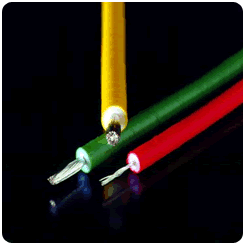 FEP or ETFE High voltage cables or PVC or PU jacket on top of CR PTFE insulation). HVCR cables are free from ageing, tracking and mechanical stress-cracking failures. GARG designs permit much higher CW and even higher Peak/Impulse power rating. 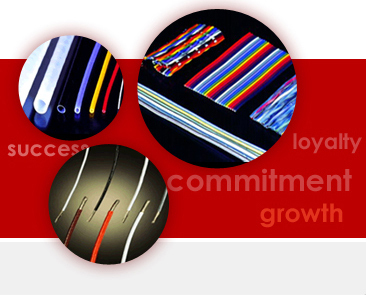 We have been manufacturing HVCR cables for more than 35 years. There are no generally accepted specifications for HVCR wires & cables. We have developed various performance and testing methods. - Solid colors are standard. - Silver-plated copper - standard. Other options like NPC available upon request. All the advantages of PTFE(except RF properties) are retained in CR PTFE: chemical inertness, Thermal/Physical/ Electro-mechanical properties from cryogenic to 260°C, and non-flammability.